This is a blog about my personal relationship with Vulcan XH558, and an eight-year quest for a perfect photograph. 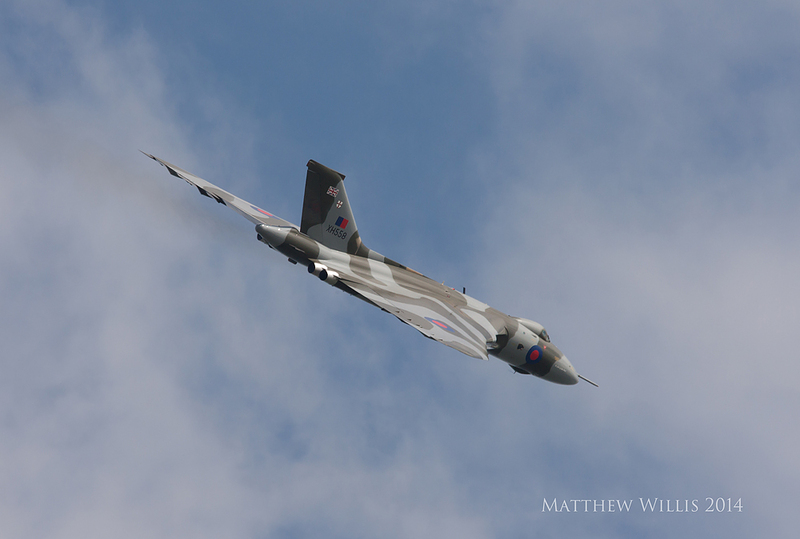 I apologise now for any self-indulgence, but it seemed important to mark the passing from my life of the last flying Vulcan, so I decided to compose a retrospective in words and photographs. I hope at least the latter will be of interest to other fans of XH558. It may seem unusual for a writer specialising in naval aviation to blog about an RAF aircraft, or indeed to become a little bit obsessed with it. 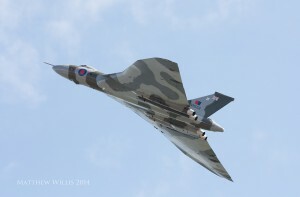 This obsession began when I saw the RAF’s Vulcan Display Team flying XH558 at the Southend Airshow in 1990. In fairness, the Vulcan has had a long connection with maritime and naval operations, from supporting the predominantly naval and amphibious campaign to recover the Falklands to 27 Squadron’s spell as a maritime reconnaissance unit with the Vulcan B.Mk2 MRR variant. (See ‘When God of Thunder became Mighty Hunter’, http://navalairhistory.com/2012/05/06/when-god-of-thunder-became-mighty-hunter/). But anyone who has seen the Vulcan, particularly in those days, should understand. If you know what I’m talking about, there’s no point in my trying to explain it. If you don’t, the same probably applies. 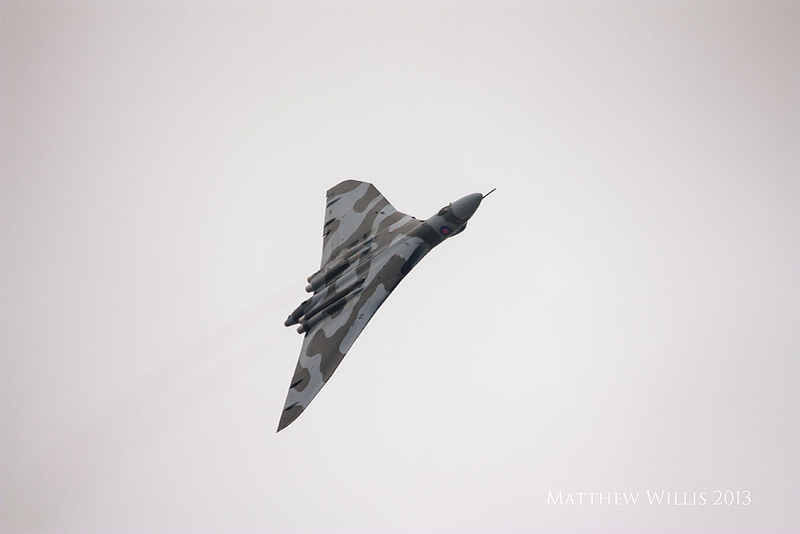 Suffice to say that as a 13 year old boy who had already been going to airshows for several years and was largely into piston-engined warbirds, the Vulcan had a profound effect on me. There are aircraft displays you see and hear. They might be spectacular and deafening. But there aren’t many displays you feel in your feet and chest, where your brain tells you your eyes can’t be seeing what they seem to be. For whatever reason, I didn’t see ‘558 again with the RAF, but in a way I didn’t need to. The memory of that blazing hot summer day in Southend stayed with me. I had been into photography in 1990, in a solitary, self-taught way and with nothing better available than the 35mm compact camera that was all my parents could afford. There was no point taking photos of aircraft in flight (you would have needed a magnifying glass to make them out) and it wasn’t until I could afford an SLR (a second-hand film Canon EOS 500) in my 20s that I began to try. After a few years with the film body I picked up a second-hand digital 350D. My first ‘airshow’ lens was a Canon 100-300mm AF, which was a good place to start, but didn’t give me enough magnification so I found a 2X teleconverter. The combination was unwieldy as hell – autofocus didn’t work so I learned to focus manually, and with the 350D’s cropped sensor I had something near 700mm available, which in retrospect was nuts. 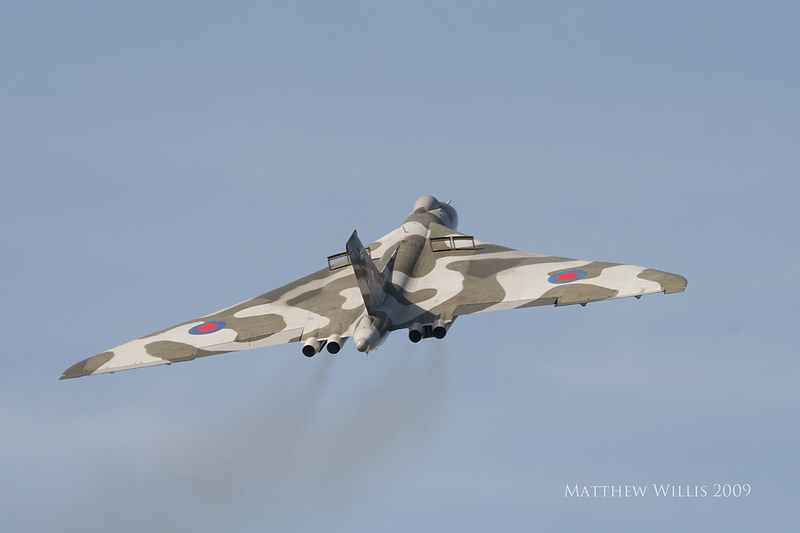 It would be fair to say I was overjoyed when the prospect of XH558 returning to the sky became a reality, and she first got air under her wheels in 2007. 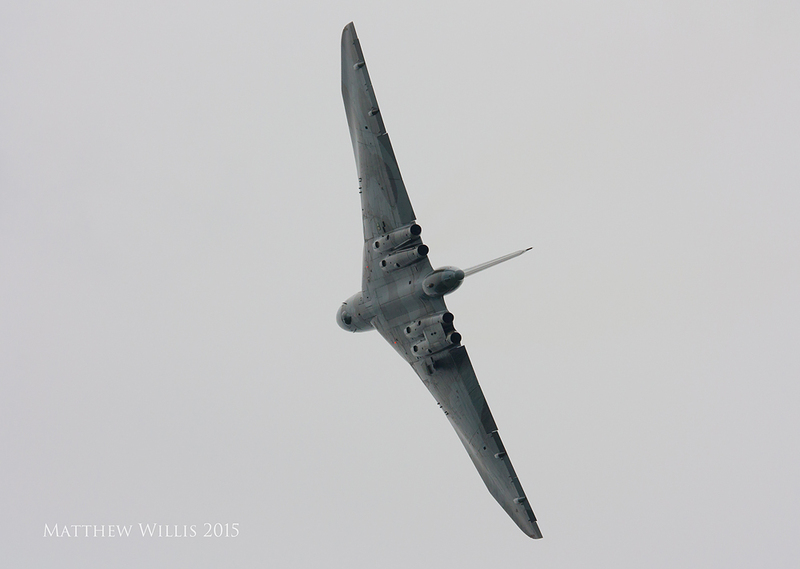 Back then, the aviation commentariat was riven by vocal idiots who were implacably opposed to the Vulcan’s return. They insisted ‘558 would never fly and the supporters’ donations would be wasted. If it did fly, they said, it would be once or twice. Maybe three times, for the big shows, and then she would be retired from the sheer cost of operation. (At least one of these failed jeremiahs has since gone on to profit handsomely from ‘558 by releasing a book on the aircraft). 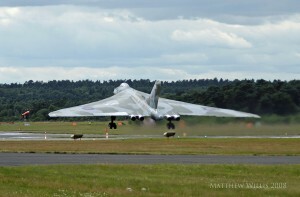 Against this background I was determined to see the Vulcan at least once more – and the naysayers may have had something of a positive effect in that they persuaded me to donate more than I could reasonably afford in the hope that it would help. 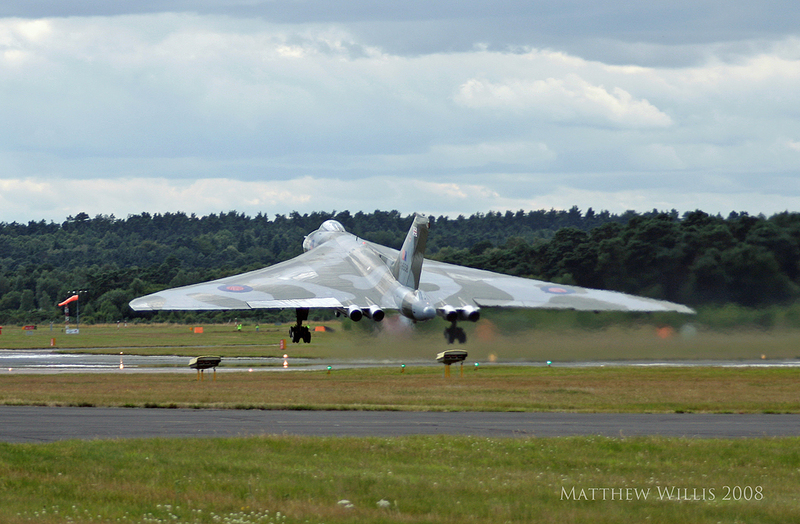 There were three big shows in 2008 that ‘558 was sure to make an appearance at – Waddington, Farnborough and RIAT. Farnborough was the nearest to me, so I duly booked up. I wanted to experience that physics-defying display again, and capture just one decent photograph if I could. It was a gloomy, gloomy day. I was still using my ridiculous lens combination at the time. In hindsight I didn’t need the teleconverter, even for Farnborough which has a pretty long flightline meaning the displays tend to take place at a fair distance, wherever you are along the crowd line. 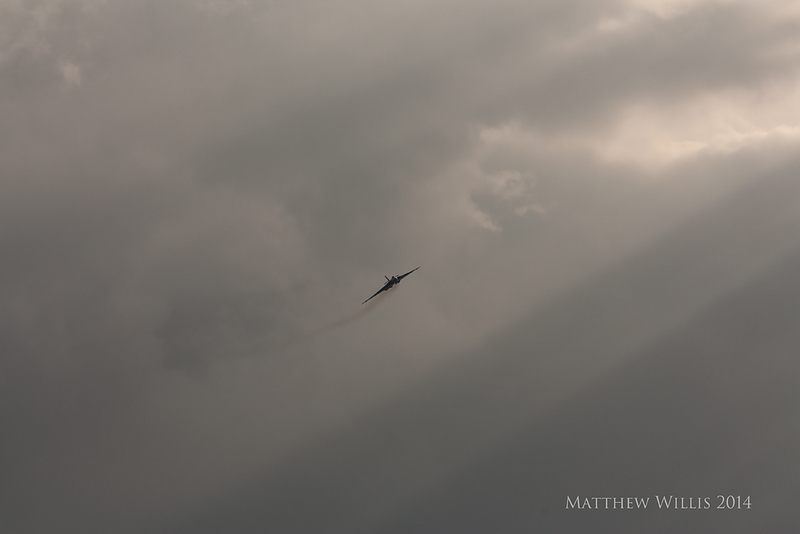 Looking back at my photos from that day, there must have been a bit of sun poking through the cloud just as XH558 took off as her upper surfaces are shining as the tiny skin ripples pick up the light. For all sorts of reasons, the display was probably more conservative than the one I’d seen before, but for a couple of moments the air was filled with the Olympian roar that seems to cocoon you in sound, and I was right back on that Southend seafront. I must have been intent on the display as I only took a handful of images. Perhaps I couldn’t zoom out enough to frame the aircraft! My best photos were of the take-off and landing. I can still almost feel her thundering by, wheels about to hit tarmac. The 100-300mm/teleconverter clearly wasn’t working, so I scraped together the cash for a new lens. I’d spoken to people at airshows who used the Canon 100-400mm lens with auto-stabilisation, which seemed to be the standard ‘serious amateur’ lens. I couldn’t begin to afford this, but Sigma did a much cheaper 120-400mm lens with ‘Optical Stabiliser’, so I bought one of these from Japan on eBay. I don’t think I ever went to a Biggin Hill Air Fair where the weather wasn’t perfect. In the mid-late 2000s it was my favourite airshow, and, at that time, on my doorstep. 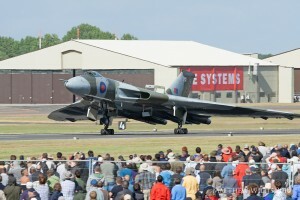 In order to see the Vulcan twice, I bought a ticket for both the Saturday and Sunday. 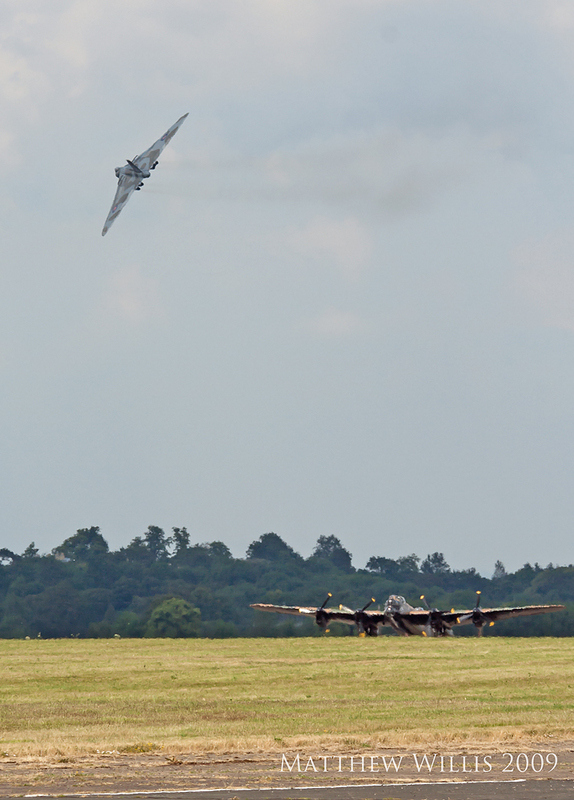 Saturday was blazing hot, and the airshow organisers clearly knew what they were about – as XH558 arrived, running in from crowd left, Avro Lancaster PA474 was waiting at the end of the runway to take off and XH558 virtually flew right over her. 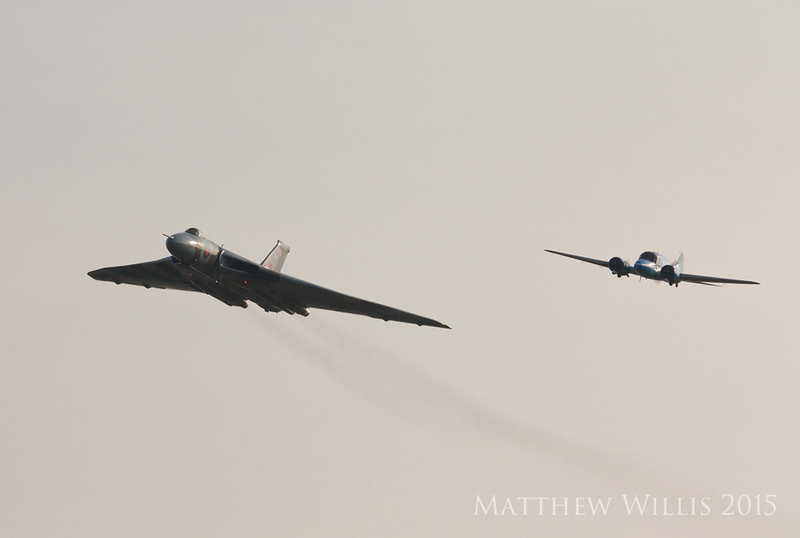 I managed to get a couple of shots with both aircraft in frame, hopelessly distant and rippled by heat-haze. Since switching to digital, I was learning fast but still on the steep part of the learning curve, and basics such as using the light metering to best effect were beyond me. I experimented with shutter speeds and apertures, and though I didn’t really get it at the time, Biggin Hill wasn’t the best site for photography as the South East-facing crowdline (at which I invariably parked myself at the wrong end) meant shooting towards the sun much of the time. 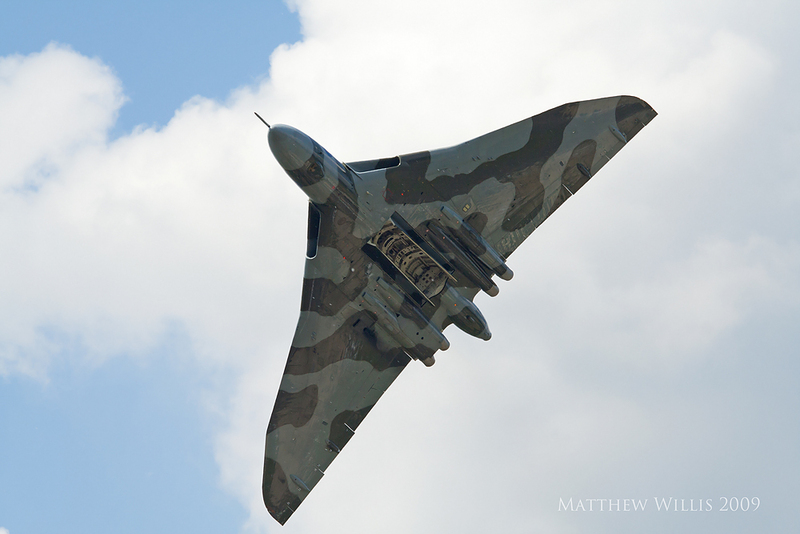 My best images from this show were of the underside of the Vulcan. 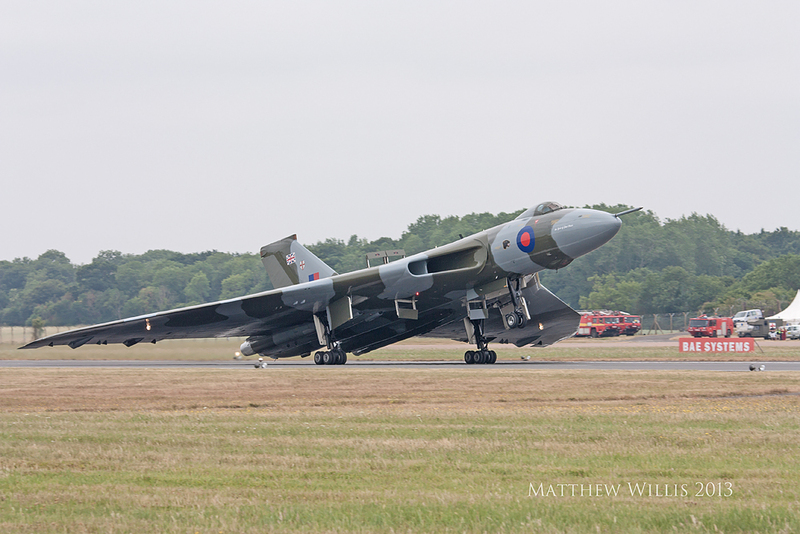 As I was learning, there are generally preferred angles for aviation photography and as a rule the front and top of the aircraft seems to be considered better than beneath/behind – although the Vulcan, with its distinctive shape, can break many of the accepted ‘rules’. Still, the underside is often in shadow, and it wasn’t until I improved at working with my pictures in Photoshop that I managed to get any of my Biggin pics to an acceptable standard. Even then I was hardly delighted with them. I didn’t go to the Sunday show – I had allowed myself to get horribly sunburned on Saturday and was sick in bed most of the day. XH558 didn’t go either. In those days she suffered a number of technical niggles that sadly prevented her from getting to a number of shows. 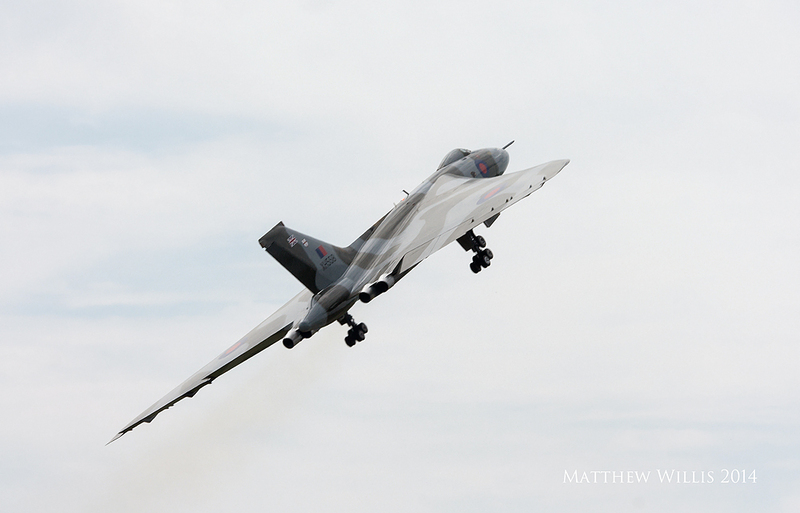 The Royal International Air Tattoo at Fairford was a bit of a no-brainer for Vulcan-spotting. At the time, XH558 was based at Brize Norton, just a few miles away – any technical issues would have more time to get fixed, and the chance of poor weather affecting the transit were minimised. Fortunately, XH558 was problem-free at RIAT on the Saturday. 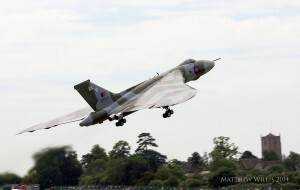 Interestingly, XH558’s operators had engaged Martin Withers as chief pilot. 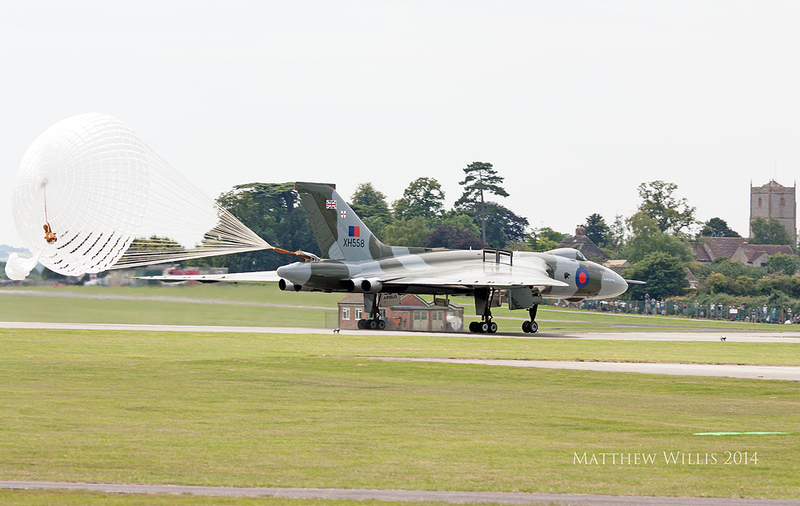 Withers had piloted Vulcan XM607 on Black Buck One, the daring Falklands raid that put the Port Stanley runway out of action for Argentinian fast jets early in the 1982 conflict. This struck me as a bit of a coup, especially with Rowland White’s fantastic 2006 book ‘Vulcan 607’ having raised the profile of the Black Buck missions. I was somewhere to the left of the display line this time, unlike Farnborough, so I was able to see the ‘display take off’ from the other side. I managed to mess up what would have been reasonably spectacular photos and none of them are pin-sharp, but the Vulcan’s great wake of jetwash was well in evidence giving a certain amount of dynamism to the shots. I decided to try converting to B&W to help cover up some of the errors and make the shots a bit more atmospheric. I was using a reasonably large aperture, so the foreground and background are a bit out of focus, which helps emphasise the aircraft. In retrospect, I might have been having trouble keeping the Sigma lens, which was very heavy, steady. It would be several years before I managed to make the Optical Stabiliser work satisfactorily. 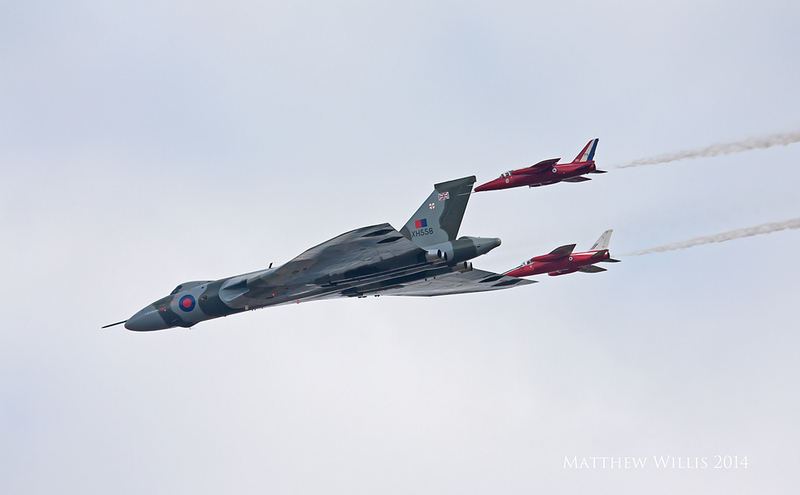 The 2009 display routine was slightly more dynamic than the 2008 one, where the speed never went over 180kt. Martin Withers introduced a new opening with a curved run-in to show the topside off, and a high-speed ‘bombing run’ accelerating up to 300kt. It certainly felt on the ground like the team had made things a bit more spectacular. Over the years, various tweaks would be made to the routine to help show off different aspects of this wonderful aeroplane. 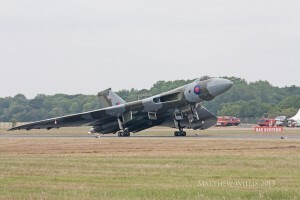 Saturday 18 July 2009 was as dull a day as Farnborough had been the previous year. One thing I was finding out from bitter experience was that it was much harder to take decent photos in low light. It sounds obvious, but I lacked the capacity to get the best from my camera in these conditions so most of my photos of ‘558 in flight from this period are pretty awful, but I did manage one OK close-up of the nose during the landing roll, at a fairly low shutter-speed to give a bit of motion blur in the background. Typical of my luck, a slight rise in the ground has obscured the wheels. I’d been a fan of the Shoreham Airshow since I first went in 2007, so when I heard that XH558 would be performing there on both days in 2009 I bought a ticket for each day again, hoping for better luck than I had with Biggin Hill. Finally, a good day with light in a reasonable direction meant I was able to get a pic I was pretty happy with. 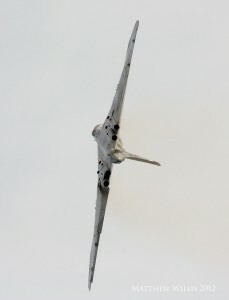 In the 2009 routine, ‘558 would follow the initial high speed run with a level break and curve back round towards the display line, then turn along it and climb steeply to 1,200ft. It was this moment I captured, and whenever I see the pic I can feel the engines thundering. I went back the next day, full of excitement for a repeat of the display. Unfortunately, due to one of those little technical niggles, there was a breakdown in communication and the crew couldn’t hear the controllers giving them clearance to display. We could see the aircraft holding offshore – it was pretty frustrating! Eventually, contact was made and ‘558 came in for a truncated display before heading down the coast to Bournemouth. Even so, when the aircraft went into its final spiral climb, she almost seemed to be directly overhead. It was pretty special. I’d been to Dunsfold Wings and Wheels once before – my brother was part of the team that restored Ayrton Senna’s 1984 Toleman and I was invited down to photograph its first run out in public. 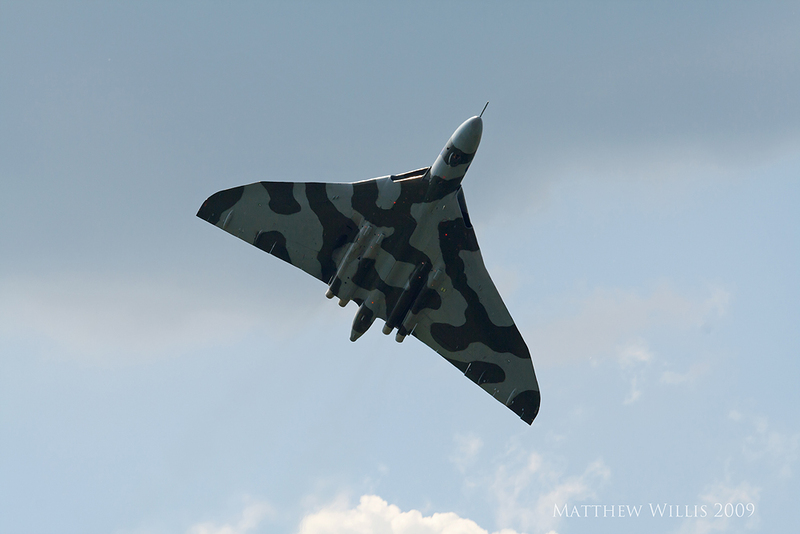 In 2009 I took advantage of the Vulcan To The Sky Club’s enclosure which was available to all members. Sadly, it was another dull day with a low cloud base that restricted XH558 to relatively shallow climbs so the customary thunder was not quite as much in evidence as usual. As I had found before, low light really hurt my photography and I must admit that to this day I’ve never quite got on top of this. One feature that was a bit more evident than usual against the pale grey cloud was the exhaust from the four Olympus 202 engines, which under certain throttle conditions seem to put out an inordinate amount of smoke. The dull conditions sapped any colour from the images, so I tried black & white on a few again, one of which showed a pleasing curving trail of exhaust smoke. By 2010, it was apparent that the naysayers had been proved spectacularly wrong. 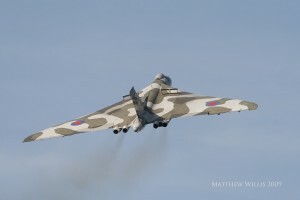 Not only had XH558 flown again, she had managed a pretty full display season with shows at everything from the big shows, Farnborough and RIAT, to smaller, friendlier seaside shows like Dawlish and Lowestoft, and even displayed in a couple of shows on mainland Europe. I had enjoyed RIAT so much in 2009 that I decided to go again in 2010. 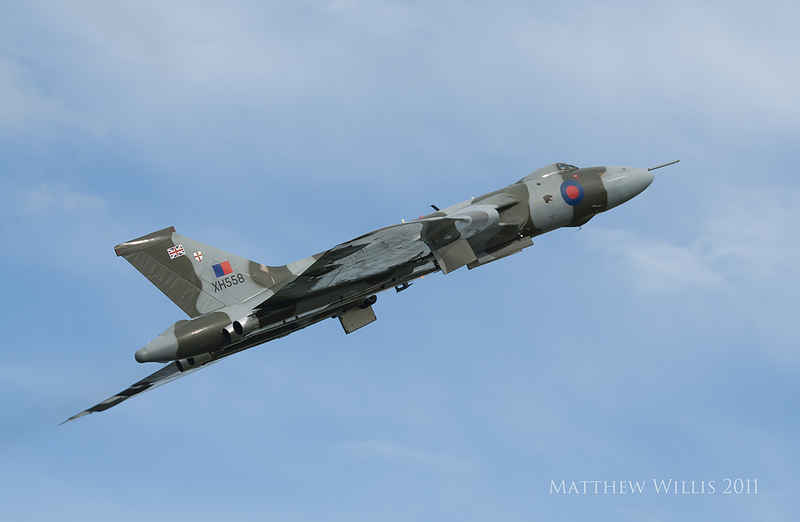 The weather was much better than in 2009 and although the hoped-for topside shot eluded me, I did get one I wasn’t too unhappy with of ‘558 banking away, blue sky and white clouds in the background, light just beginning to illuminate the nose and leading edge. 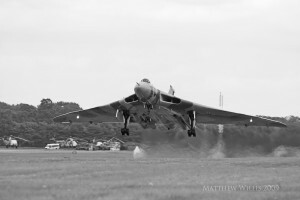 We were treated to a great deal of ‘aerodynamic braking’ on landing, where the pilot kept the nose up for much of the landing roll, using the drag of that big delta wing to bleed the speed off. (Apparently it costs several thousand pounds to re-pack the braking parachute, so this isn’t used unless it’s strictly necessary). In the landing pic, it’s possible to see part of the large crowd, all intent on the aircraft. 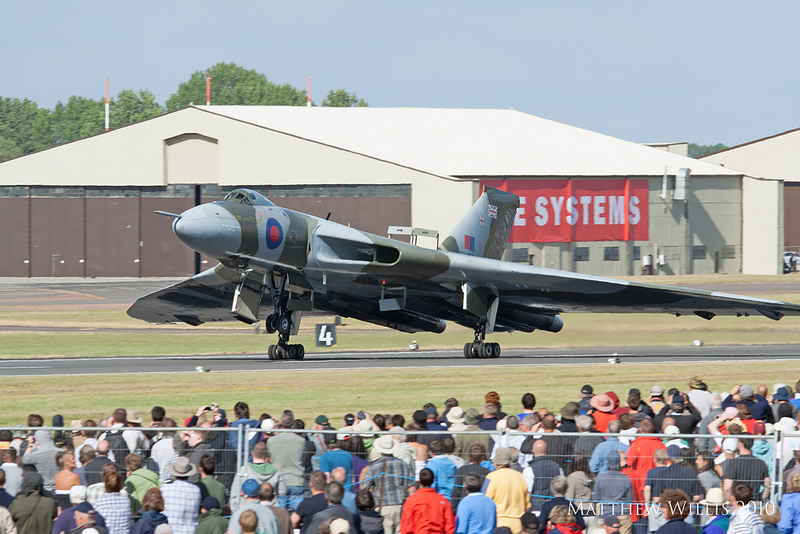 From XH558’s return to flight the phenomenon known as ‘The Vulcan Effect’ was quickly in evidence, and nowhere more so than at RIAT. As the aircraft taxied to the end of the runway before a display, you would invariably see people springing up from chairs everywhere, pushing towards the fence. The sound of turbines spooling up would be punctuated by a tattoo of camera shutters. There’s no denying it is a very special aeroplane to a lot of people, and wherever it goes it turns heads. The East Anglian seaside town of Lowestoft had had an airshow since 1997. The Southend airshow no longer existed, but shows like Lowestoft and Clacton had started in the meantime, and I was thrilled at the opportunity to see XH558 over the sea again. My parents live in Essex and occasionally come to airshows with me, so I stayed with them the night before and we went along in the morning. Lowestoft has a huge, broad, sandy beach that faces East South East. Once again, I failed to appreciate how this might affect photography. This was a minor concern compared with the weather. It was distinctly chilly for August, and heavy rain showers had been sweeping through all day. I was resigned to ‘558 staying away. I just didn’t see how the aircraft could make it through the weather. Then, at around three o’clock, the clouds parted and there was XH558’s unmistakable profile in the distance as she held offshore. I don’t know whether the aircraft sounds different over water or whether it’s just perception, but it seemed to. There was more of an echo to the roar. In among all the rainstorms, the light had a sort of bilious, yellow quality which was reflected against the nose and tail as the Vulcan pulled into its final climbout. The angle of these photographs is not dissimilar to the Shoreham ones, but the odd light and the brooding sky give them a very different feel. I was lucky with this show. The entire middle of the British airshow season was wiped out by appalling weather, and XH558 missed four shows on the trot, including Shoreham which I had tickets for. 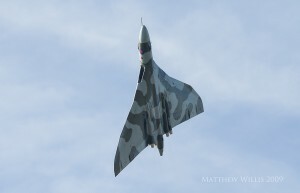 The naysayers had been proven well and truly wrong about the sustainability of the Vulcan, and it was now a regular fixture on the airshow circuit. Nevertheless, I was determined to see ‘558 as many times as I could. I was, quite simply, hooked. By now I was booking airshows solely based on whether ‘558 was going to attend. I’d never been to the Abingdon Air and Country show before, but since moving to Southampton in November 2010, the Oxfordshire airfield was within easy reach. The weather was typical of the fine late springs we had for a number of years. It was a charming little show with a surprisingly full and varied lineup – crowned of course by the Vulcan, which was due to close the show. I chatted with Phil O’ Dell, the Rolls Royce test pilot who had been added to XH558’s list of left-seaters, and he was thoroughly charming and fascinating, signing my programme and chatting about the aircraft. (I was always a bit overawed and star-struck on the occasions I met Martin Withers so this was nice). 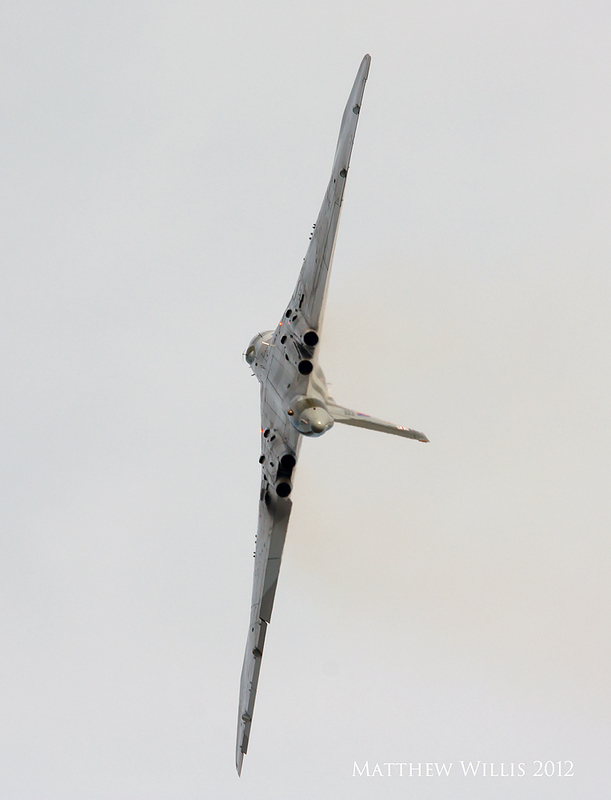 On this occasion, XH558 arrived from crowd right, and for once I was reasonably well-placed to capture the curving approach! The clouds had started to build but the light was still good and I managed a topside shot that I have not really bettered since. Result! The display was wonderful, noisy and dynamic and I think much closer to the display line than I had seen before. 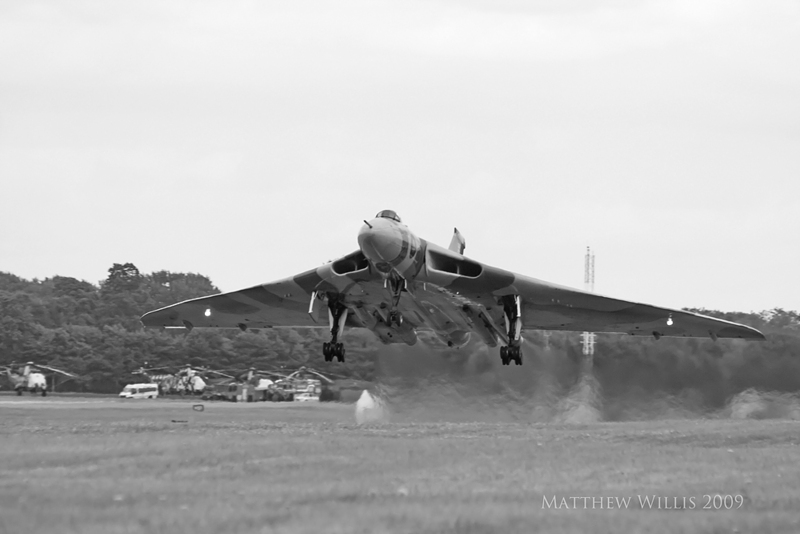 Another favourite moment came during the simulated landing, and I managed to capture ‘558 as the landing gear folded away and the jets opened up for the final climb out. A great display and a wonderful way to wrap up the event. And finally some more decent photos after over 18 months of trying! The Yeovilton Air Day was another new show for me, surprising perhaps as a naval aviation enthusiast. Having moved house the previous year, it was now much more within reach. As I’d come to expect for July, the weather was dull, and RNAS Yeovilton has a South-facing flight-line. 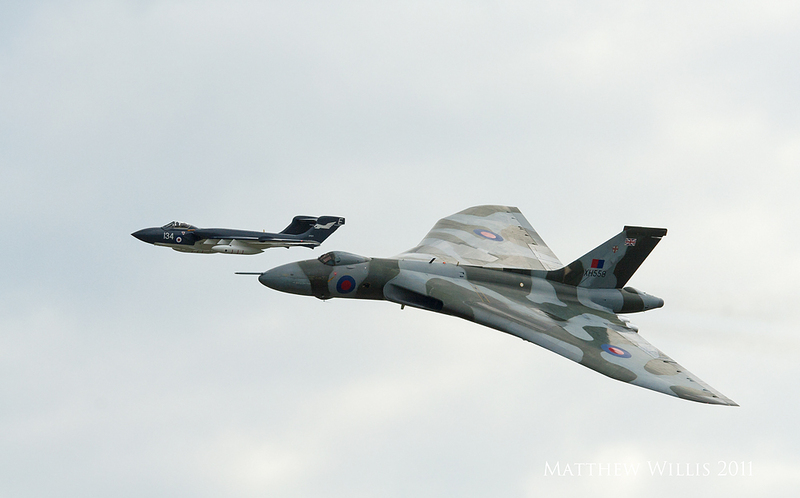 Still, I was (more by luck than judgement) at the right end of the display line to catch the topside approach, and to cap it all, XH558 did a couple of formation flypasts with my other favourite aircraft, the de Havilland Sea Vixen XP924 – the V-bomber and V-fighter together was a real treat! My photograph of the two aircraft breaking formation makes it appear that they are only feet from each other – they aren’t, it’s the foreshortening effect of the telephoto lens. Still, the extent of the dull weather made the photos very ‘noisy’ and washed out. They still weren’t what I was looking for. Even the upgrade of my camera to a second-hand Canon 450D didn’t help much. 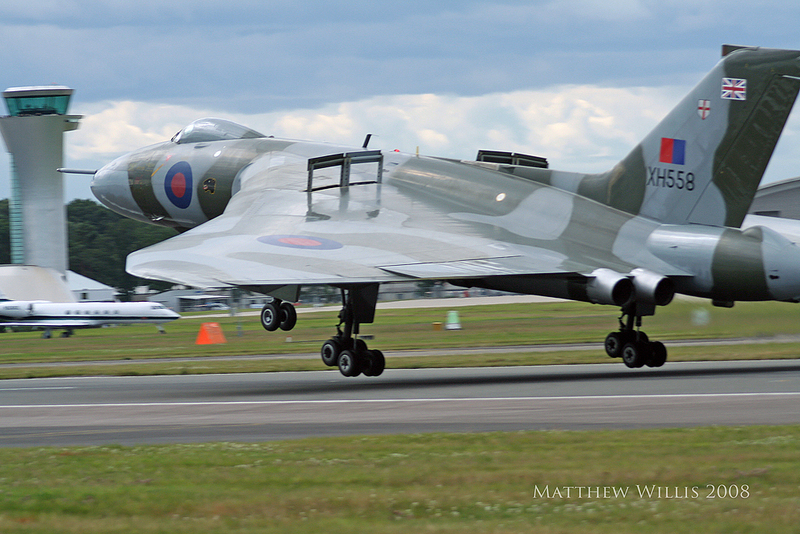 For a second year, ‘558 failed to make it to Shoreham so that was my 2011. 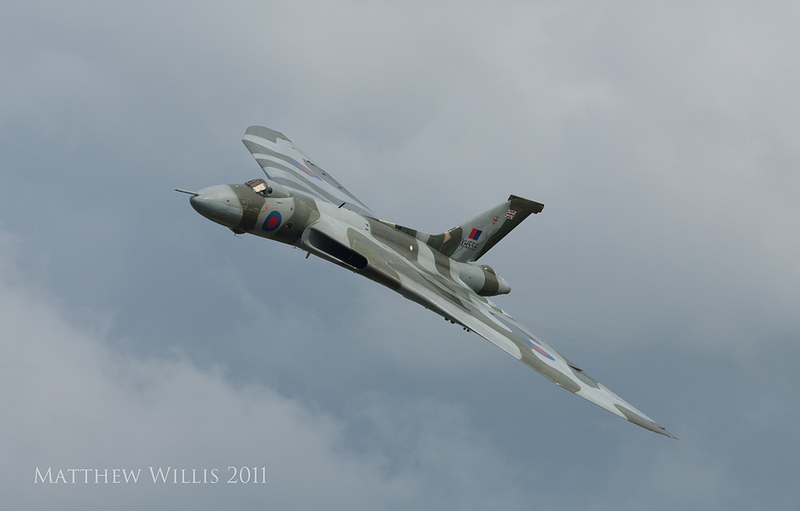 It was almost another year until I saw XH558 flying again. A week after the aircraft poignantly led a flypast to unveil a new Falklands War memorial, two engines were damaged beyond repair and had to be replaced. This led to the beginning of the display season being missed, but ‘558 was back in time for RIAT, where pilot Kev Rumens stunned the watching crowd by appearing to roll ‘558 almost inverted at the top of the takeoff climbout. The display routine seemed to have been made a bit more dynamic each year – the spiral climb had been moved from the end to the middle, making for another high-power manoeuvre in the set, for example. The addition of Kev to the left-seat roster made things more dynamic still. I still kick myself that I wasn’t there to see it. As I slowly, painfully learned how to be a better airshow photographer, I was finding that it’s not enough to have a perfectly lit, sharp and framed photograph. It needs to have dynamism and movement. No-one wants to look at a photograph of an aircraft sitting there placidly as if it’s not even moving. At almost any angle of pitch and bank, the Vulcan starts to look exciting. When straight and level though, photos don’t really do the aircraft justice. 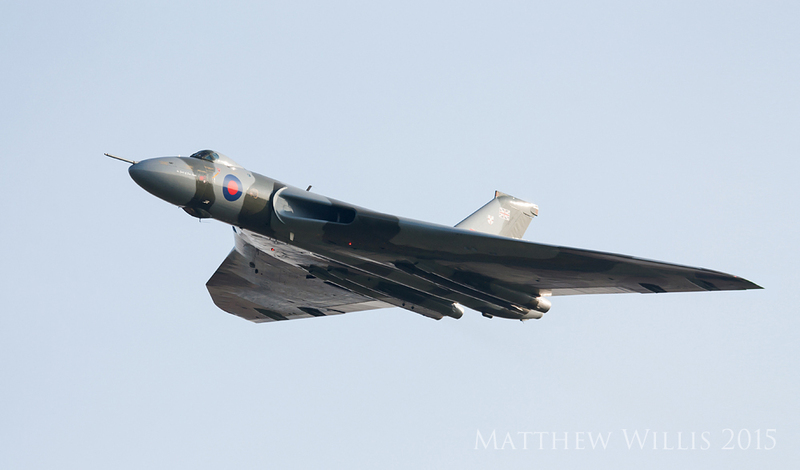 For the first time since 2008, I only went to one airshow where ‘558 displayed. 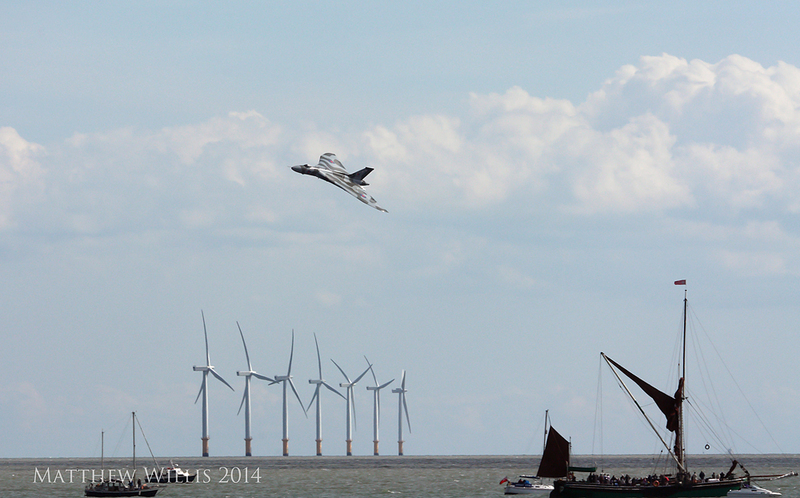 This was Clacton, in August, an airshow near my parents’ house, which I usually attend every year. 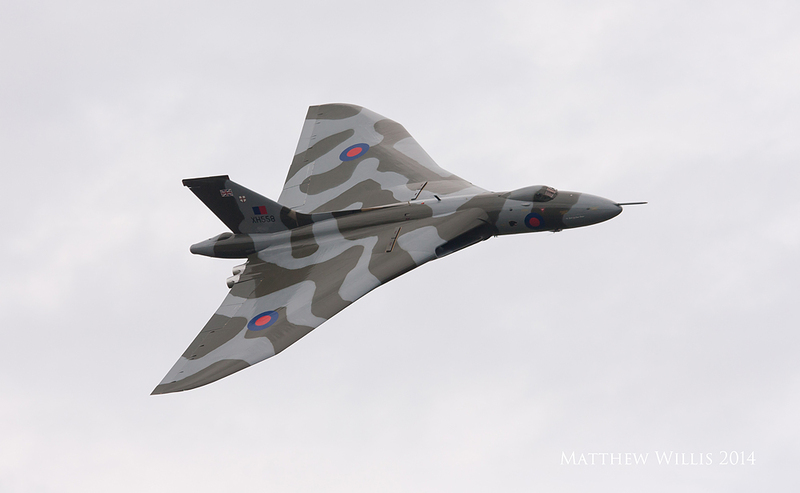 It was a nice bonus to see the Vulcan booked at what is effectively the ‘spiritual successor’ of Southend’s 80s and 90s seafront airshows. 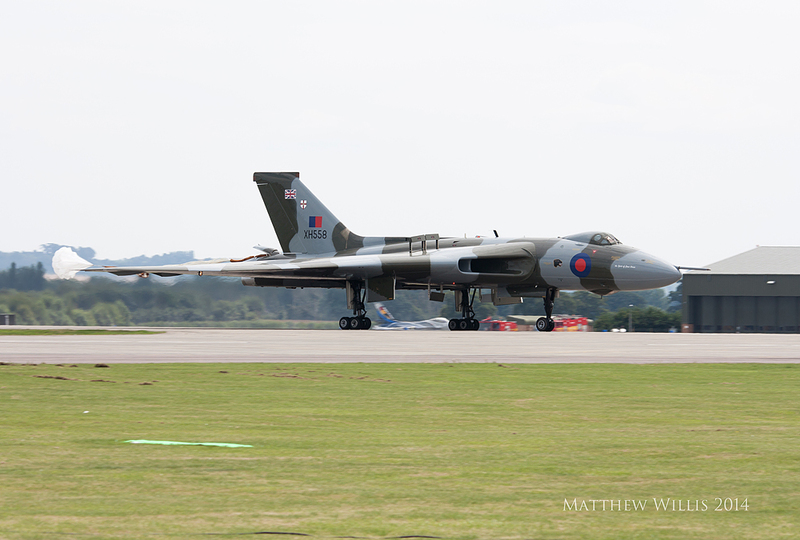 Before that, I had see another Vulcan, this one strictly ground-bound, with the wonderful XM655 fast-taxi at Wellesbourne in July. My 400mm lens was way too much, and I ended up at the wrong end of the runway when I let poor advice overrule my instincts, but I managed to capture the moment that pilot Mike Pollitt lifted the nosewheel and half the port main bogie too! 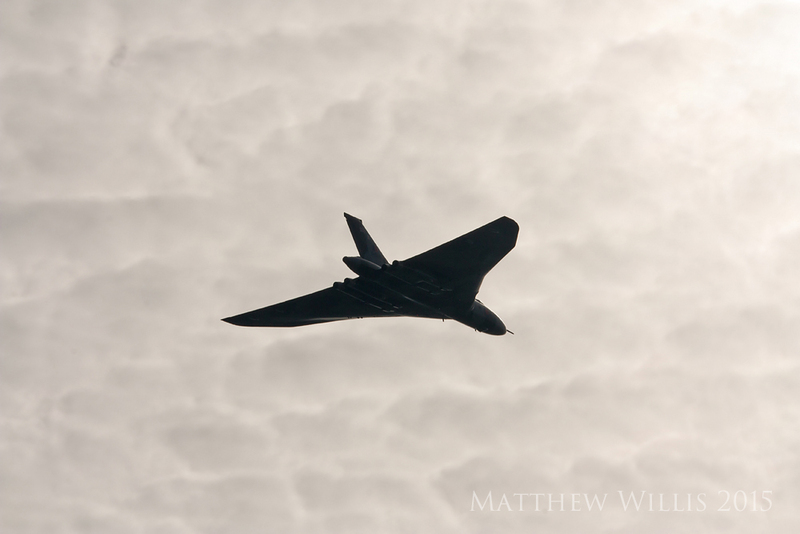 Later that month I managed to keep up my record of seeing ‘558 at least twice every year since ’08 when, thanks to Twitter I managed to spot the aircraft over my house as it transited between the Goodwood Festival of Speed and Yeovilton Air Day. It was a beautiful day at Clacton, deep blue skies and a few white fluffy clouds. Phil O’Dell was piloting, and while he didn’t throw it around quite like Kev Rumens, it was a spirited display. I have since found out that the Vulcan is an easy aircraft to climb, with its powerful engines and huge wing area, but hard to lose height in. For that reason, the pilot rolls into a banked turn when the desired altitude has been reached, and quite often they go ‘over the vertical’ to help drop the nose to descend for the next manoeuvre, and I was able to capture one of these steep wingovers. I find it a reasonably interesting shot, regardless of the fact that it’s of the back and underside, with a bit of jetwash rippling the tail but the rest of the airframe sharp. ‘558 had been repainted this year – contrast the somewhat faded appearance in some of the previous shots to this one. She was looking very glossy and sharp. 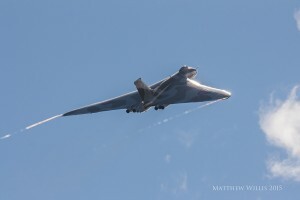 Since I’d gone freelance in 2010 I was generally less able to afford airshow tickets, especially RIAT, which tends to be at the pricier end, but thanks to a photographic competition run by the Royal Aeronautical Society, I won a ticket to the 2013 event. The photograph I entered? The balked landing climbout shot of ‘558 from Abingdon two years before. At RIAT, Kev Rumens was flying again and while he didn’t quite repeat the almost-half-roll at the top of the initial climb that he had the previous year, it was by far the steepest wingover I’d seen and maybe up to 45 degrees beyond the vertical! The photos were rubbish but they capture the moment, so here’s one. 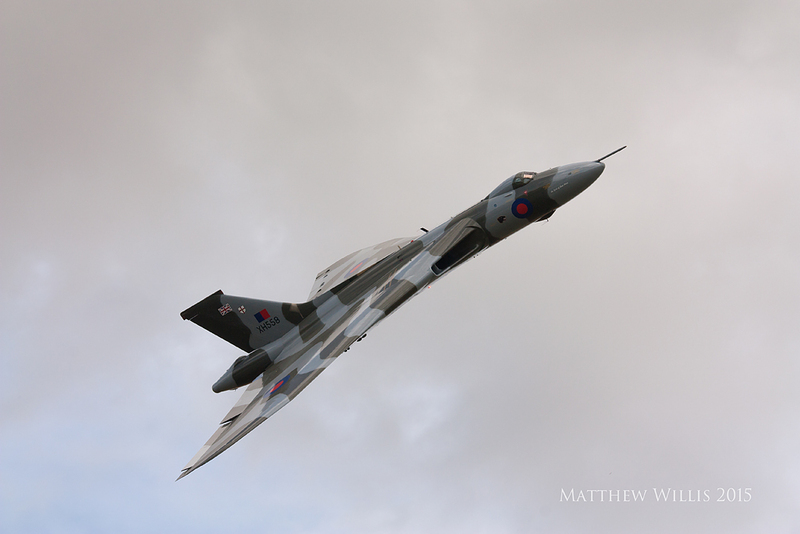 It was the cloudiest, gloomiest day I’d experienced at RIAT, but Kev’s flying made up for it. I’m only sorry none of my photos was remotely presentable. I only took a few, perhaps I was gawking too much. Not content with just being spectacular in the air, Kev landed ‘558 with the longest ‘nose-up’ roll I had seen, the tail bumper hovering inches above the tarmac (I’m not sure it didn’t touch once). The organisers of the Clacton Airshow, with some savvy, had decided to book XH558 for the Thursday and the Red Arrows for the Friday, so there was a big draw on both days. Once again the weather was superb – until shortly before the Vulcan was due to display when a thick mist rolled off the North Sea! The perils of seaside airshows. This killed any hope I had of decent photos. It did have a side benefit though. 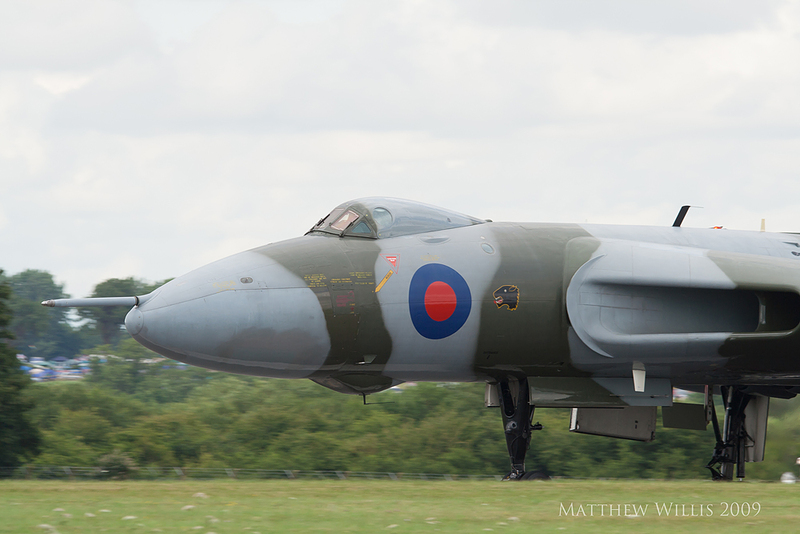 The famous ‘Vulcan Howl’, which I haven’t mentioned before but is such an important part of the aeroplane’s display, seems to be amplified in humid conditions. The howl, for those who haven’t heard it before, happens when the throttles are opening and seems to be a function of huge volumes of air being sucked into a narrowing intake by two engines set side-by-side. Oddly, the 200-series Olympus engines make the sound but the more powerful 300-series don’t. It’s an unearthly sound. A single, low-pitched note that sets the hairs on the back of the neck standing on end, and it drops in tone as the turbine-whine increases. You can only hear it at certain angles to the aircraft. 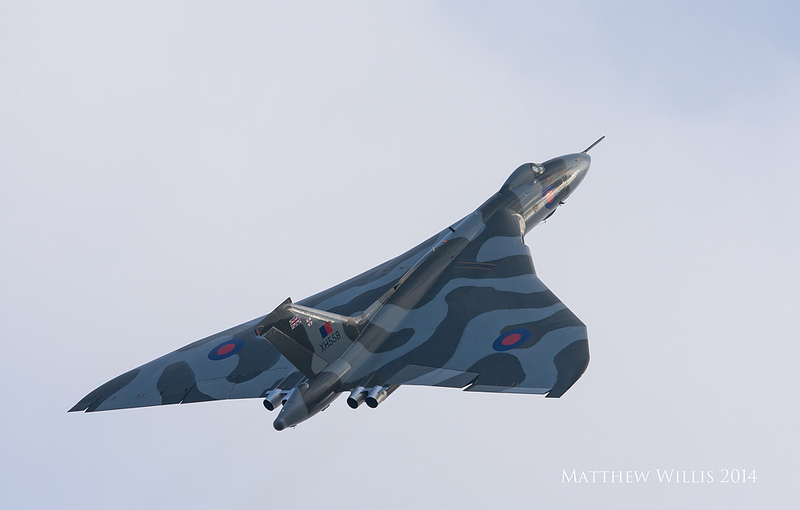 It’s yet another characteristic of the Vulcan that sets it apart. To my eternal regret, you can’t photograph a howl, and it’s a bit late for me to get into sound recording. It doesn’t get more humid than a seaside covered in mist, and as the Vulcan tipped into a spiral climb the crowd was treated to not one but two of the loudest howls imaginable as she came round each time. 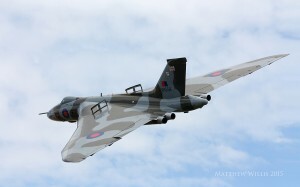 By 2014 it was apparent that we were in the last couple of years of Vulcan operation. Even though the cynics had been proved utterly wrong, there was only so much airframe life, engine life, and engineering experience. What goes up must come down. 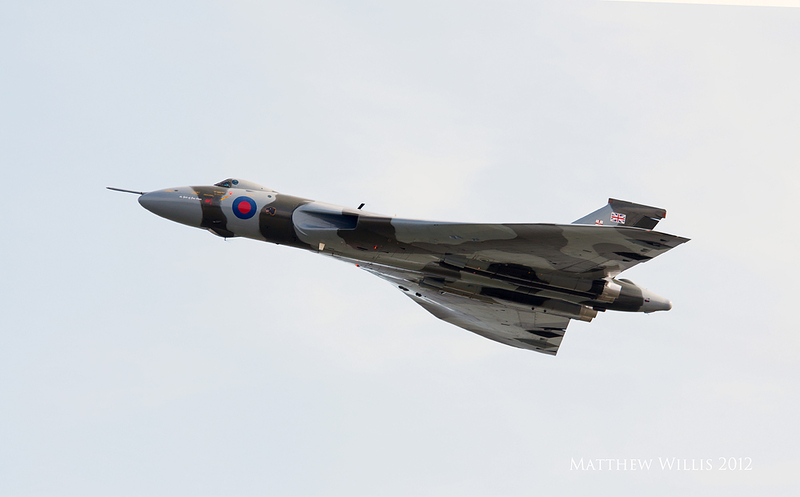 I’d gone down from four ‘Vulcan’ shows a year to one or two, but in XH558’s last years I was determined to squeeze more sightings in, partly to say goodbye, partly to savour the experience as much as possible, and partly because I was still hunting for that perfect photograph. Once again I had to wait until July before I got my first sighting – Yeovilton Air Day. Blisteringly hot for a change. In an effort to minimise shooting towards the sun, I stationed myself at the right end of the crowd line, which turned out to be the wrong end for any topside passes. New for 2014 was a change to the display take-off – instead of pulling into a climb and rolling out at the top, the pilot pulled the aircraft straight into a banking turn virtually as soon as the wheels had left the ground. This was, I’m told, a favourite feature of many of the display flights from the 80s, and it was pretty spectacular. If the photos revealed the angle of bank to be less than it had seemed at the time, seeing an aircraft manoeuvre like that with its gear down still seems pretty astonishing. More or less all of the images during the flying display I managed to screw up, leading me to wonder if I had in fact learned nothing in the past six years. On landing the aircraft, though, Martin Withers evidently felt there was too much speed or not enough runway and streamed the braking chute, which I’d never seen this before – as mentioned previously, it was a rarely-used asset because of the expense of repacking. By chance I captured the moment the drogue released, and managed a couple with both aircraft and chute. I posted the drogue shot on Twitter and was asked to provide some pics of the chute itself by one of the team that had helped pack it, which I was only too happy to oblige. Clacton again. 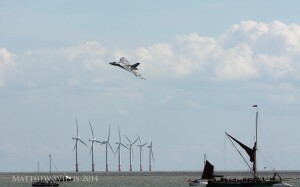 It’s always a bit special to see the Vulcan circling out over the muddy grey North Sea, the spectator boats and wind turbines as a backdrop. It was another lovely day at the seaside show, and I managed to get a couple of decent photos too. Nothing to match the Abingdon ones, but a nice shot of the beginning of a climb, and a side-on shot as she curved away at the top. A day of mixed weather at Dunsfold on the Saturday – there was a little blue sky, but barely enough to make a Dutchman a pair of trousers. 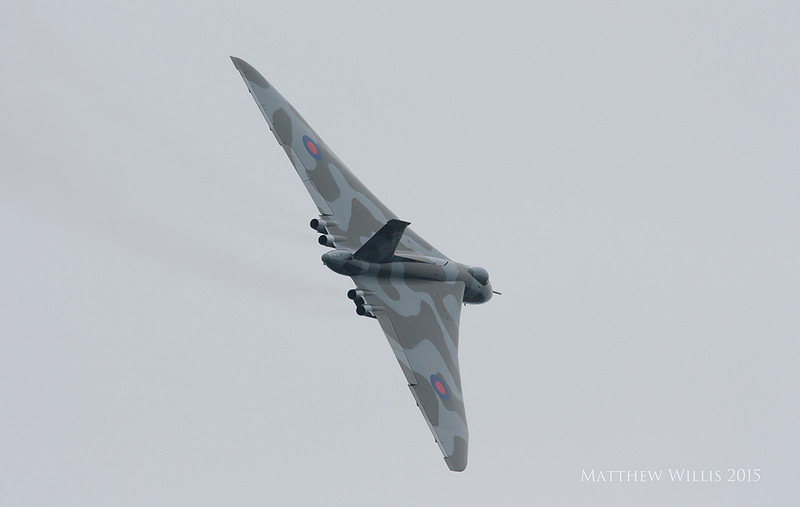 Once again, I was in about the right place to catch ‘558 as she curved in from crowd left, showing the top of that distinctive delta profile, and despite the gloom, a decent photo or two resulted. Pretty noisy, but sharp. 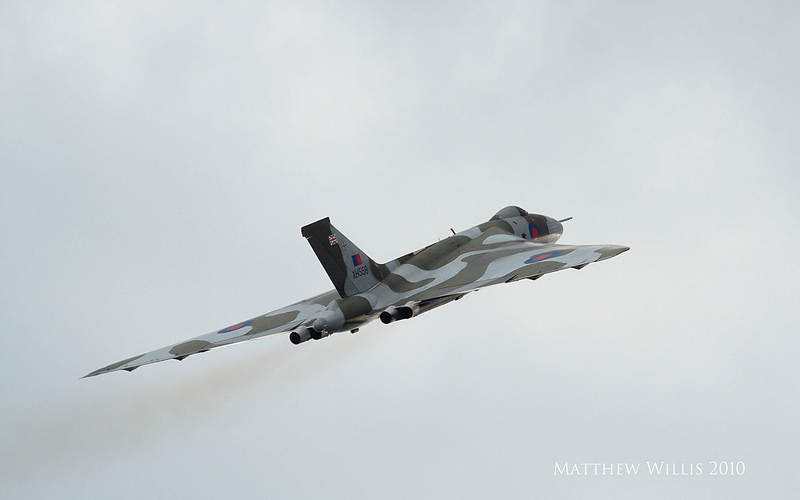 The final show of my Vulcan year was at Duxford, a place I had never managed to see the Vulcan before. (I’d been to one show where she was on the bill in October 2008, but weather prevented her from coming). I’d never managed to see ‘558 in formation with the Red Arrows, as she had done several times in both her RAF and post-RAF career, but at Duxford, a flypast was staged with two Folland Gnats, one wearing Red Arrows colours and both streaming smoke, so this was the next best thing, and I was pleased to see the Gnats in formation as I’d missed the first such flypast by going to the wrong day at Dunsfold. Again, the foreshortening makes it look as though they are closer than they really were – the starboard Gnat seems to be resting its nose on XH558’s wing! The sun shining in bars through the dense cloud formations provided some artistically interesting aspects. There had been a few more changes to the display, potentially to favour engine life over airframe life. One such alteration was that the final climbout was entered at higher speed so lower power could be used. The result of this, I’m told, was that the climb and wingover at Duxford was the steepest yet experienced! The picture certainly seems to bear this out. The upper surface of the wing was in shadow, but there was some nice liquid light on the nose. Naturally, as she rolled right into the wingover, presenting her entire upper side to the light at a still-impressive angle of pitch, far closer than I’d ever been, I ballsed up the photo. 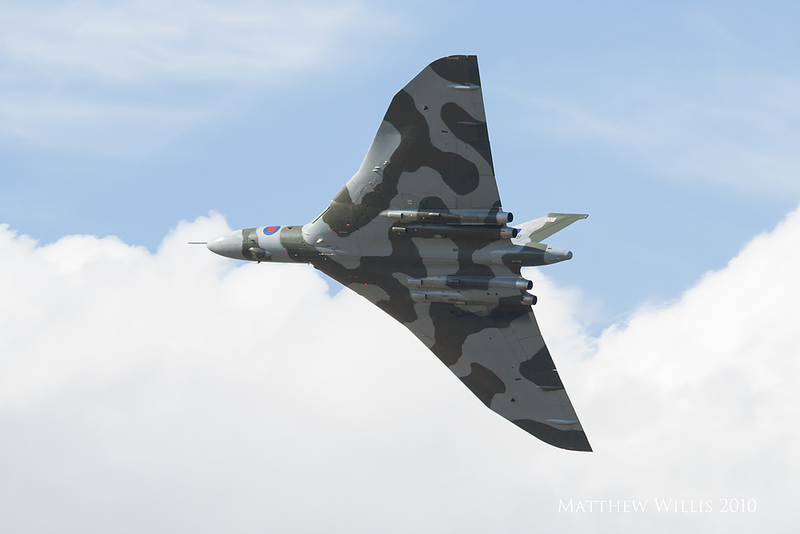 One show in 2012, three in 2014 and four in 2015, the last year of Vulcan operations. I’d have happily made it five or six if I could have afforded the tickets and the time. The first was the Old Warden Military Pageant at the Shuttleworth Collection’s Bedfordshire home. I’d last been to an Old Warden airshow in the 1990s and it was lovely to be back. 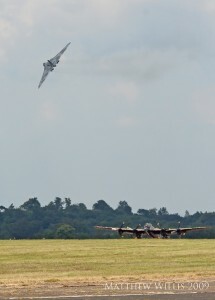 It was the Vulcan’s first and last appearance there. The weather was pretty good – generally sunny, with only the one or two light showers and a bit of cloud affecting proceedings. 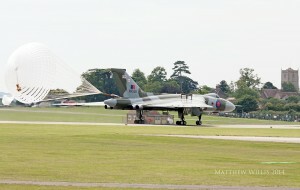 The wonderful thing about Old Warden, where the Vulcan is concerned, is that it has an L-shaped flightline. This meant that in almost every case where a normal display would have had a straightforward flat flypast, XH558 flew a curving, topside pass! 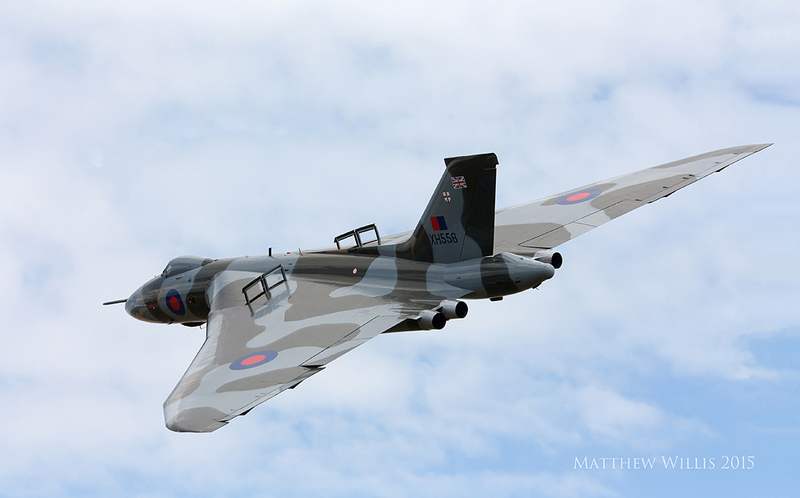 I was in photographer’s heaven, and finally managed to take a couple of more-or-less classic topside shots to equal or better the ones I had taken at Abingdon with my old camera back in May 2011. I had a ticket to the Shoreham airshow, intending to go on the Sunday. The tragic Hunter crash led to the display being cancelled. After thinking about things for a while, I decided to go to the Bournemouth Air Festival instead. The shock did not seem to have sunk into the airshow world the day after the accident, and in many respects it felt like a normal airshow, somewhat different to the two shows I went to over the following seven days. After I got thoroughly soaked for several hours in the morning, the sun decided to come out in the afternoon and it was a glorious day by the time XH558 arrived, early (presumably due to the cancellation of the Shoreham display) at about three o’clock. 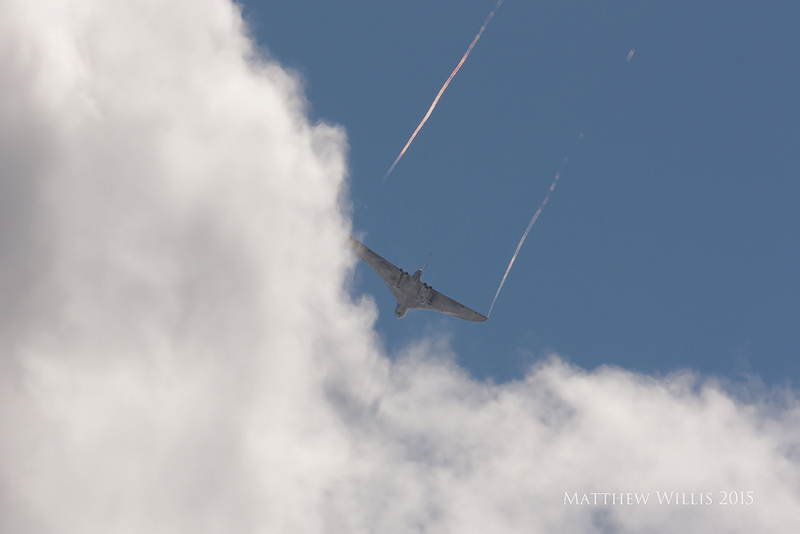 There was no topside pass, but it was a great display with some wonderful, haunting howls. 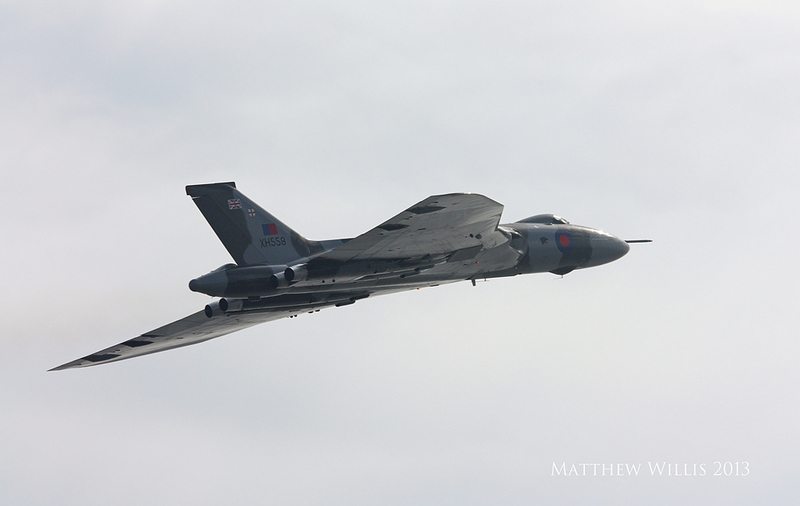 The last of these, as the throttles were opened for a last pass, was possibly the loudest and longest I had heard. A development for the 2015 season was the ‘zoom climb’ – an acceleration to 300 knots, and pitch-up into a steep climb that takes the aircraft all the way to 7,500 feet! 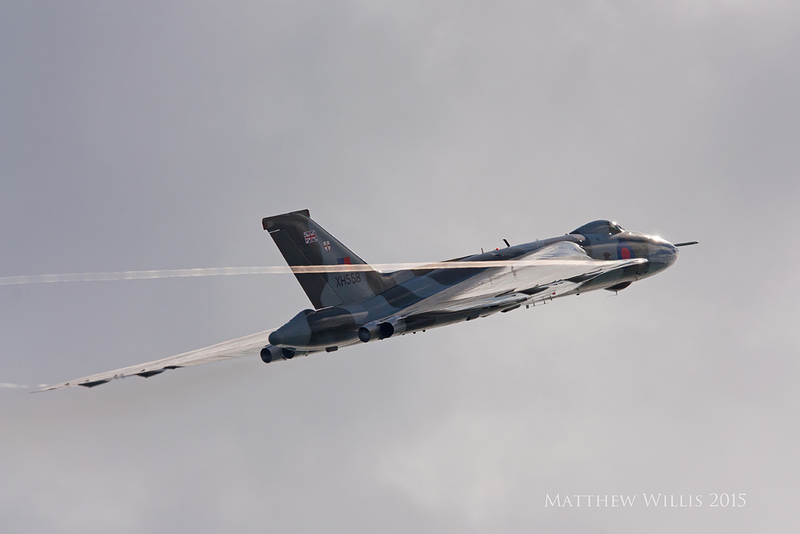 As XH558’s nose tipped up, I saw a phenomenon that was new to me – beautiful, tubular contrails formed, streaming off each wingtip, and turned rainbow colours in the sun. As she roared up into the blue, in an ever-steepening climb, sun burning off her paintwork, it was one of the most beautiful, moving sights I had ever experienced. Clacton was a relatively late booking for 2015, and turned out to be the first major airshow held after the CAA had imposed restrictions on vintage jets. Ironically, these didn’t apply to airshows held over the sea, but it was clearly having an effect on aircraft operators and airshow organisers, as for whatever reason, the Clacton display was the gentlest Vulcan display I had seen since Farnborough in 2008. Moreover, the aircraft was so far away from the crowd that it was hard to feel any connection to the display. It was totally understandable, but felt anti-climactic. Only in the final climb and wingover did something of the old magic return, and I was pretty pleased with one of the photos of her, ‘hanging in the air the way bricks don’t’. 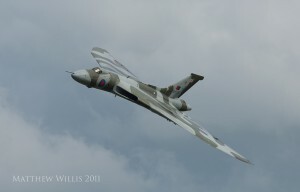 My last chance to see XH558 in the air where she belongs was Dunsfold Wings and Wheels – my third airshow in seven days. The weather forecast was poor for both days, so I hoped for the best and went on the Saturday. It started bright, but got steadily duller as the day went on. 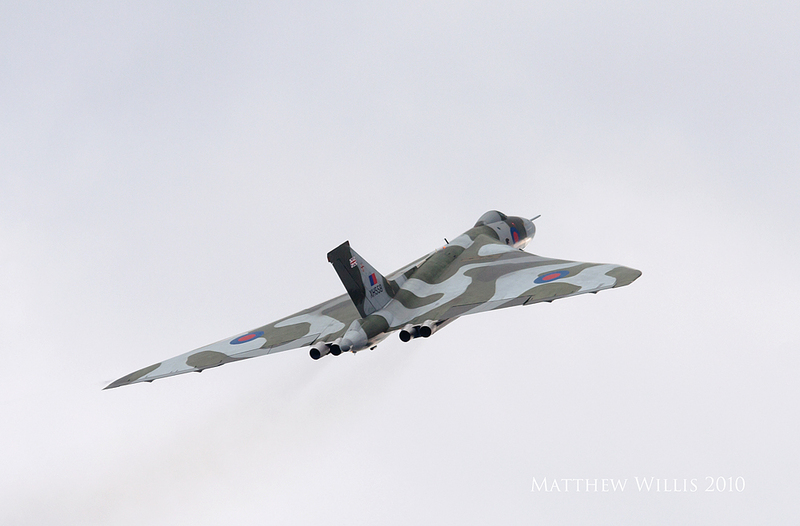 XH558 arrived at around three o’clock again. The display, in the hands of Kev Rumens, was much more like the old display than the one I had seen at Clacton, and the intake howl rang out over the airfield two or three times, although the zoom-climb was no longer permitted, and bank-angles were restricted. Good photos were in short supply. It didn’t seem to matter. As she rolled level at the top of the climb and cruised away, the rain began to come down, steadily, and then more and more heavily. 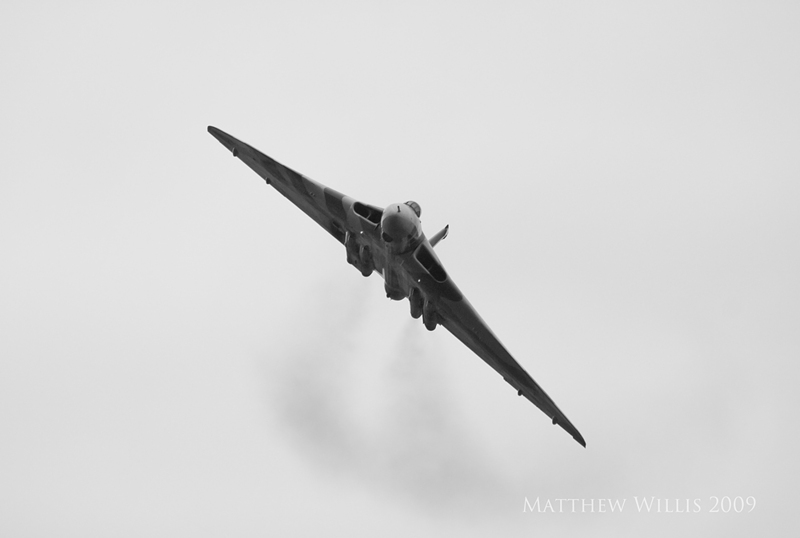 The sky was weeping for the last flying Vulcan, soon to have her wings clipped forever. Not quite yet. During the drive home, as I reached Hamble I saw out over the sea through the murk a long, thin form, thickening in the middle. 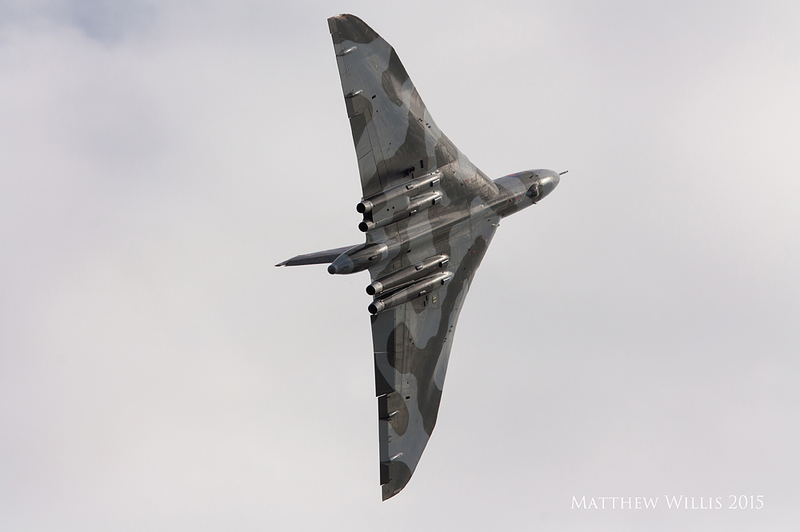 It looked like the Vulcan does as she flies directly away. Surely just my eyes playing tricks? Apparently XH558 had flown to the Isle of Wight that afternoon, and thought I had caught my last, indistinct glimpse. Of course, then it was announced that ‘558 would do one more airshow, at Old Warden. After nearly wearing out the refresh button on my computer (demand crashed the Shuttleworth website) and spending half the next morning on the phone, I had tickets. Understandably in view of what had happened in between, the display was less spirited than the one earlier in the year, but the crowd still got its howls and roars, and a touching flypast with a distant relative, Shuttleworth’s Avro 19 Anson. The roads around Middle Wallop and the Museum of Army Flying were full like I’ve never seen them. Cars and people lined the roads for miles. Every so often, little ripples would pass through the crowd, as someone following Twitter would reveal a new update and it would scatter through the mass of people waiting to catch one last glimpse of the delta silhouette. Typically, she caught us out, curving in from behind the main hangars nearly five minutes ahead of schedule, and treating everyone to an unexpected circuit and pass with the bomb-doors open. The sky had formed into odd, glowing scales of cloud, and as ‘558’s throttles opened up and she headed, roaring, smoking, into the beyond, it looked appropriately volcanic. They aren’t great photos, but they capture that lurid farewell. If I have to remember her flying away though, perhaps the best way would be as she had been at Bournemouth – screaming into a blue sky, rainbow contrails streaming, casting shadows on the clouds, and finally swallowed up in the immensity. Matthew Willis is a writer, editor and journalist specialising in naval aviation. He runs the blog http://navalairhistory.com and has been hooked on Vulcan XH558 since 1990.